I can’t remember exactly what it was that set me off down this line of thought, but I have thinking about my next Whole 30. I had intended to complete another Whole 30 in July this year, a half year check in since my January Whole 30. Despite my best of intentions to live an 80/20 life of food, it hasn’t worked. If I’m honest, I’m not sure it has ever worked for me. When I am good, I’m really good. If I am not tempted by anything, it’s all super easy, but if I have the taste of something, that’s it – it’s a lost cause. While I can’t pinpoint the exact time that I started thinking about my next Whole 30, I am quite sure it was after I had eaten a lorry load of junk during (and after) a training session at work. It’s just so easy to slip back into eating garbage. Yes, my willpower could do with a bit more exercise, and maybe some would say that I don’t want it enough (it being losing weight). Maybe sometimes, that is true – with so much else going on, sometimes I forget that actually I do need to do something positive for my physical health. Perhaps it’s an addiction to sugar (most of my foods of choice tend to be sweet things). I don’t know, but I know I need to change. I am lucky not to have any medical issues or autoimmune diseases, but my relationship with food is still, three Whole 30s later, poor at best. Have my Whole 30s been failings? No, not at all. I’ve learnt lots about myself during and after each one. I just don’t think I have done them for long enough. I could consider doing a Whole 45 (45 days), or 60 (60 days). I could, but I’m not. I’m considering a Whole 100. I want to have a really good stab at it. I wrote a while ago about something that really gets my goat – the New Year’s “it only takes 21 days to form a habit” rubbish. For me, 21 days just isn’t long enough. Thirty days isn’t long enough. Perhaps 100 days will be enough for my brain and body to realise that there really is life without sugar all day every day, and that the life after that can be pretty good (if the 30 days are anything to go by). I’ve tried to read about what sort of things to expect, and it seems that food boredom is top of the list. I’ll be rolling out my well used copies of Well Fed 2 and Nom Nom Paleo and working my way through some of the new-to-me recipes in there. I am also considering buying another paleo cookbook, but I haven’t decided which yet. In terms of when to start, I am going to postpone until after my Mum’s birthday, as we are planning to go out for food (probably Wagamama), so factoring in some time for batch cooking, I think I am looking at a start date of Monday 9th May, making the 100th day Wednesday 17th August. As for blogging, I won’t be blogging every few days as I have done in my previous Whole 30s, but will do a round up once every 10 or so days. I am currently thinking what to do about my Weigh in Wednesdays, as the consensus is to stay away from the scales during a Whole 30. Anyway, that is my current plan. I have Friday off to exercise my inner domestic goddess and get some batch cooking done, and help batten down the hatches. Categories: food | Tags: food, food prep, weigh in wednesday, whole 100 | Permalink. Hurrah for long bank holiday weekends (and the two four day weeks!). Despite having a week off earlier in March, this long weekend has landed at the right time. We didn’t have much in the way of plans for this weekend, though I had a list that I wanted to work through (half completed, so that’s something!). It has just been nice to have a little bit of downtime, though unfortunately work impeded on it a little bit – never mind! Matt and I needed to head in to Exeter do run some errands and pick up a couple of things. It was an absolutely gorgeous day – the first real spring-like weather that I think we’ve had this year. Normally, when the weather is nice, rather than eat in a restaurant, we like to get something to eat outside and sit on Cathedral’s green. Lots of people had the same idea, and it was tough to find somewhere to park for a bit! After we’d finished, it seemed a shame to head straight home and retreat indoors. Instead, we headed to Killerton for a wander around. We’ve been meaning to stop by and have a wander around since we renewed our National Trust membership in February, but hadn’t quite got to it. Rather than head into the house, we walked around the gardens with our cameras. The flowers in the walled garden aren’t quite out yet, but there are a lot of other pretty things to look at. I was trying to get a picture of some pretty blue flowers (I’m not at all green fingered, and literally know about 5 different types of plants – the rest are referred to by colour), and then fell into a mole hole and rolled my ankle. Well done me. Not to be deterred, we took it a little slower but kept going and eventually came across the chapel, which isn’t too far from the parkrun start line. We used to visit Killerton a lot as a family when my sister and I were little, but I don’t remember ever going in to the chapel. It was wonderfully quiet (outside was reasonably noisy, owing to the egg hunt), and the sunlight shone through the stained glass window, making a beautiful pattern on the wall near the altar. It really was stunning. After admiring the light show for a bit, we wandered back to the car and headed home. I don’t know what it is about the fresh air, but when we got home, we crashed on the sofa. We’ve resolved to go back soon to go for a proper walk in one of the forests, around the old parkrun route, or one of the many other walks (and probably should do the house too!). True to the forecast, the weather turned really grim and grey (and wet! ), so we’d tried to make sure that Saturday was a more of an indoor day. It started with a trip to our local butchers and greengrocers. The butcher very kindly de-boned and skinned the chicken thighs for me (I am complete pants at doing this myself) while Matt got the veggies sorted. This is probably a silly thing to say, but I am constantly surprised by how nice people are where we live now. We returned home and I set to work in the kitchen. I’ve not tried the pork meatloaf (looks strange, but smells amazing), Spanish chicken or the mustard lamb before (and obviously a Jamie Oliver “15 minutes” is a normal human’s “30 minutes”). I am pleased though – it was a long time on my feet, but totally worth it. Plus, we were treated to a pretty gorgeous sunset as I came to the end of my cooking. My sister has come home for the Easter break, so I headed down to Mum and Dad’s for the day. My sister cooked an amazing curry (a Slimming World one I think), and we had a really relaxed afternoon, just catching up and putting the world to rights and making a fuss to this little loon. Dad went out as he plays in a band and they were playing down a pub, and Matt stayed home to do some tidying up. It was definitely a case of donning the flippers to get home. The amount of standing water on the roads was absolutely crazy, but I made it home safe and sound. I headed back to my parents’ house today, while Matt sat in the queue on the M5, attempting to get to his parents’ house (the traffic was pretty awful from what I gather). Mum, Dad, my sister, gran and I had lunch at the local garden centre, before Mum and I toddled off so I could try and show her the type of flower that I would like in our garden (it’s a small, blue flower, and lives in a rockery type environment). We couldn’t find it. Pudding was courtesy of Orange Elephant. I am sure I said this on my old blog, but if you are ever in the area, head over to Orange Elephant at Lower Brenton near Kenn for the best ice cream you will ever have. The lambs have not long arrived too – what’s not to love – lambs and good ice cream! Anyway, the delayed Sunday blues have kicked in quite hard, and I’m aiming for an early(ish) night as I have a very long day ahead of me tomorrow. Categories: Being Active, food | Tags: Cullompton, Exercise, Exeter, food prep, holiday, Killerton, National Trust | Permalink. Whole 30 Days 28 to 30: Round 3 complete! Happy Day 30 to me! I am going to get my thoughts down on how all of my Whole 30 went during round 3, but for now, I’ll carry on with my previous format. How I’m feeling: I have to admit I feel pretty sad today. It isn’t food related, but I was shocked to hear about the passing of Terry Wogan. As a self-confessed, and perhaps premature Radio 2 listener (a TOG if you will), Terry Wogan, Deadly Alancoat (Alan Dedicoat), Lynn Bowles and Boggy Marsh accompanied me on all of my commutes to work when I lived in Chesterfield. There were a lot of times that I had to stay in the car just to hear the end of whatever they were talking about, often belly laughing about snorkers or a poem. Incensed when Chris Evans joined, I reconverted back to Radio 1 with Chris Moyles, but it wasn’t the same (I don’t dislike that many people, but I really don’t like Chris Evans). Instead, Terry then accompanied Matt and I when we went on Sunday morning journeys. It was fitting then, as I was at Mum’s for lunch, that we ate and listened to her CD of Janet and John stories (please check them out if you haven’t heard of them before, they’re pure genius). He’s so gorgeous. It’s been another good day, plenty of energy despite the late night last night. I definitely feel that I’m riding the crest of the wave. How I’m feeling: I am pleased about the return of sweet potatoes! It has been quite a long time for us to have gone sweet potato free. It was another late night, and all things considered, I don’t feel bad at all. I’ve had a really productive day at work, which continued in to the evening. I had some stuff to do when we got home, then had tea, and then made up a meatloaf and prepared a stew which will be cooked tomorrow. It does mean that we’re eating meatloaf for the next few meals, but I don’t mind that too much. I also prepared breakfast. I can’t believe it’s Day 29 already! How I’m feeling: I am feeling excellent. I had a long team meeting this morning, and I felt that I was alert and able to contribute without any mental fug or distractions about feeling hungry. I have kept back up on my fluid intake again, though I have noticed I’ve started to get a sore throat. I am hoping it’s nothing and I’ll be able to fight it off quickly if it does develop in to anything. Matt weighed himself this morning, and he reckons that he has lost a whopping 25lbs! That is really fantastic, and I couldn’t be more pleased for him! He’s ready to go down the next jeans size too, so he’s pretty chuffed with it all. Whole 30 Days 19 to 21: on the up! Categories: food | Tags: food, food prep, paleo, weekend, weight loss, weight loss journey, whole 30 | Permalink. Since my last post, my Whole 30 goodness has really started to come in to its own (at last!). A couple of irritating breakouts aside, the summary is – I’m feeling great! For me, ignoring the grumps and grottiness from earlier in my Whole 30, this is what it’s all about. How I’m feeling: I feel really good! I had the day off today by myself as I was owed holiday from last year. I had quite a relaxed start, made a cup of tea but didn’t really feel like having any breakfast. Despite being technically on holiday, I had some work that I needed to do so cracked on with that, interspersed with doing the washing. By lunchtime I was quite hungry so I made prawn stir fry which was really lovely. It did use the last of my cashew butter though (sad times). I definitely want to cook something with chillies in it soon as I am missing some heat in my food. As I came towards the end of my work and the laundry pile, I remembered that Matt said he needed some chopped tomatoes and passata for the sauce for tea, so I decided to go out for a walk. Instead of heading straight to Tesco, I went the long way, before deciding the go past Tesco and walk to the bottom of town to Aldi. I bloody love Aldi. I’d not really shopped there before December but I’m a convert. I don’t think you can taste the difference either! I got home and set about doing some washing up, clearing the surfaces down and also sorting out the cat litter (the joys!). All in all, it’s been a good day. I’ve had plenty of energy (so I haven’t spent the whole day sat on my bum as I probably would have done two weeks ago) and I’ve been quite productive. When Matt came home, we had tea and settled in to watch Legend. How I’m feeling: My lack of planning is getting the better of my breakfast. I ended up eating from the canteen this morning. It’s been another pretty good day. I’ve had a good level of energy, my skin is beginning to clear a bit after a breakout last week and I’m doing well on the concentration front. I’ve also had more ideas for blog posts than I have had for ages, which I think is a combination of Whole 30 concentration and focus courtesy of my new Life Planner from Lollipop Designs x Blogtacular which is all kinds of awesome. I’ve spent a lot of the evening filling the diary up with my life and whatnot. I am not a great blogger in that I don’t plan posts very much. I think this is why I end up going AWOL for a bit, as I struggle to think of things to blog about if I leave it too long. I’m going to give the planning thing a go, based on what I already know is going on in my life. I feel like I am winning. How I’m feeling: I was unprepared for breakfast or lunch today. Big oops. A combination of lack of sleep, unpreparedness for breakfast and lunch and a couple of dull meetings has been no fun. I don’t even know why I was so late to bed which makes it more annoying. Despite being tired, I don’t actually feel too bad (just not as good as I have done for the last couple of days). Early to bed for me tonight! On the plus side for food preparation, my HUGE Muscle Food delivery arrived today. It was almost too heavy to carry, and I could feel the bottom of the box bulging as I was carrying it, so the first thing I did when I got back to my desk was re-tape the seams. I have some batch cooking to get on with – first up is pulled pork as we haven’t had that in absolutely ages. We’ll also be having Cincinnati chilli and meatloaf (all made Whole 30 if they’re not originally paleo). I’m not entirely sure what I am going to do with the chicken. Quite possibly I think Fiona’s green chicken might feature, and I might attempt a curry. I’m not sure what sort of curry yet though. So, after what has felt like a really slow start to my Whole 30 round 3, I’m onto a winner now. Categories: Being Active, food | Tags: coping, food, food prep, paleo, weight loss, weight loss journey, whole 30 | Permalink. 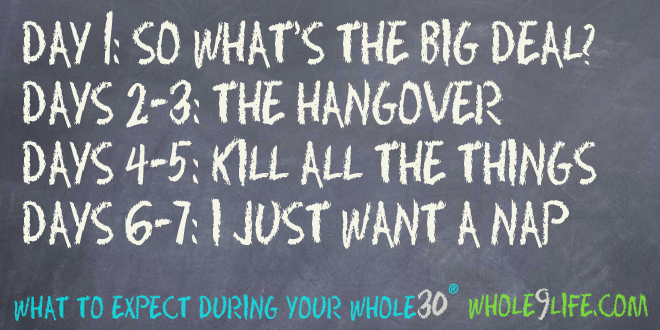 I thought I’d cluster a few days of what I’m eating and how I’m feeling on my third round of Whole 30. In short, it’s going pretty well. In my last post, I said that I wasn’t doing a huge batch cook of 20+ meals. It creates too much mess in the kitchen, I am stuck in there all day on a Sunday, and I still have to prep lunch and breakfast so I wasn’t gaining much from my preparation. Plus I have the chance to inject some good variety in to my meals. Going in to my third round of Whole 30, I wouldn’t say I felt terrible, but I just want to curb the bad habits and focus on getting into a healthier place. The short of it is that I am actually doing okay. Nothing hurts, I don’t have much in the way of cravings aside from a cup of tea! How I’m feeling: Pretty good so far. It was the first day back at work, and I am pooped. I swear it was like getting up in the middle of the night to get ready. Food wise though, with the exception of a rubbishy steak, today has been good. I wanted something sweet after tea, but watched some YouTube videos to distract myself. I think I probably became a bit grotty during the sweet craving part of the day (sorry Matt!). How I’m feeling: Again, still pretty good. I slept well (which is no surprised given how tired I felt yesterday). I’ve tried to make sure that I’m drinking a lot, and while I’ve been a bit hungrier today, it hasn’t been too bad. Normally “the hangover” kicks in now, and certainly that has been true for me in the past, but I really do feel okay right now. I prepped breakfast and lunch for tomorrow, and rescued tea from the freezer. I also managed all the washing up and some budget work (a goal for 2016) and some other bits and pieces, so it was overall a very productive evening (which is VERY unusual for me – I’m not often very productive in the evenings). How I’m feeling: The hangover stage definitely still hasn’t kicked in yet. I’m sleeping well (though I’m tired, but I think that’s more the return to work after Christmas than anything else!). Breakfast kept me full until lunch, and I started to get hungry around 4:30pm in time for tea at 6:30ish. The only thing I really would like is a proper cup of tea. I prepped breakfast and lunch for Day 4, and also roasted some more veggies as they’re good to pair with lots of things. I was hungry still after tea though, so made myself a little egg omelette thing which helped. How I’m feeling: I got new winter pyjamas for Christmas, which I wore last night, and they are so warm and fluffy that I am crediting my good sleep to them. In the interest of balance, I then had an awful breakfast. I don’t know why I cooked the turkey really, as I don’t like it plain (it needs a sauce to be edible). Thankfully my lunch made up for it. I think I could probably live off that chilli if I had to. I’m still “hangover” free and I’m not at the “kill all the things” stage (I don’t think). I have had a bit of a breakout of spots, which is annoying, but nothing makeup doesn’t fix. I have broken out in my past two Whole 30s around this time, so it isn’t a massive surprise. That’s my first four days done and dusted. I am wondering whether I am going to get stung massively with some bad feelings/temper problems/sleep issues later down the line, as I really have had a pretty good ride of it so far. I’m even considering adding some exercise in. I’m not entirely sure what sort of exercise at the moment, and I’m thinking to add it in after I’ve passed Day 14, but I’m definitely giving it some thought. How has the start of January been for you? Categories: food | Tags: food, food prep, weight loss, weight loss journey, whole 30 | Permalink. I’ve been giving my diet some thought recently. While it has improved massively since we moved out of our flat and into our own house, there is still a lot of work to be done. I can also feel some old bad habits beginning to sneak back in. While my takeaway consumption has reduced drastically since September 2015, I have been lazy and swapped the takeaways for microwave meals for tea and canteen fodder for lunch. It’s time for a reset! Whole 30 is a strict framework in which you cut out all processed food, dairy, refined sugars, grains and legumes. You can read more about it here if you’re interested. Part of me feels like it hasn’t worked – I’ve done this before, lost weight, gone some way to improving my habits, only to fall back into old ones and pile all the weight (and more) back on. I’ve given this round a lot more thought about whether I should do it, bouncing from “I don’t want to be so restricted” to “it’s just 30 days”. Then I’ve got to thinking – what’s the worst that can happen? I could go back to old habits at the end of the 30 days and put on even more weight. I could really kick start my focus on health and make 2016 the year of healthiness. I know which I prefer! I have a couple of changes in mind. In January last year, I logged everything in My Fitness Pal. Looking back at this now, I think it was the wrong thing for me to do. It took away the intuitive “am I hungry” foundation and was replaced by “how many more calories/macros can I have today”. That said, it was interesting to note that the days that I was lower on my calories tended to be followed by a more hungry day. Anyway, there will be no My Fitness Pal in my Whole 30 this time. I’ve also identified that Nakd bars, while I do love them, aren’t very good for me psychologically and give me a crutch to lean on when I think I want something sweet. The reality is that I don’t need anything and that these lovely little bars can trigger a binge behaviour (I don’t care what food is in front of me, if it’s in front of me, I’ll eat it). I’m not buying any at the start. The same applies for juice. Juice will be much more moderated this time – no sweet fixes from liquids! I’m also going to limit my weighing in. In both of my previous Whole 30s, I weighed in a lot. I became more obsessed with it I think, especially in my second one. This time – there is a scale fast going on, which also means no Weigh in Wednesdays until February. I haven’t cleared the house of non-Whole 30 foods (Matt is kind of joining in, but will be more flexible). I have re-read the programme rules. Muscle Food deliveries that we’ve stored are going to be used up first. Aldi is my friend (one of the worst things about Whole 30 is the sudden rise in food bills). I’ve spent the afternoon today making up batches of Cincinnati chilli from Well Fed 2. This is an absolute favourite of mine, and while it takes a long time to cook, it is worth it. I’ve also made up some braised cabbage, and roasted some parsnips and carrots with rosemary and garlic. The fridge is stocked with cold meats for Matt, and there is a large amount of salad going on. The kitchen doesn’t look like a bomb site, which it usually does when I batch cook for nearly a whole month. In the past, I’ve tried to make as many meals as possible so that nearly the whole month of evening meals is planned out. This has made breakfasts and lunches quite stressful because they’re much less planned. This time, I’ve gone for a couple of main meals, cooked up some more versatile ingredients and will do leftovers. I absolutely do not want to be stuck in the kitchen every night prepping for breakfast, lunch and snacks the following day. Left overs will be fine. I’m starting tomorrow, 4th January. It’s my first day back at work and there are two birthdays in the office this week, and I’m off to see my friend on Friday for cider and Malteasers (which will be sparkling water and maybe some dates if I want them for me). Nothing like the present though! Categories: food | Tags: food, food prep, paleo, weight loss, weight loss journey, whole 30 | Permalink.